Plenty of Space to Relax, Unwind, BBQ and De-Stress. WiFi. Bakery, Supermarket and Bar 5 mins walk. 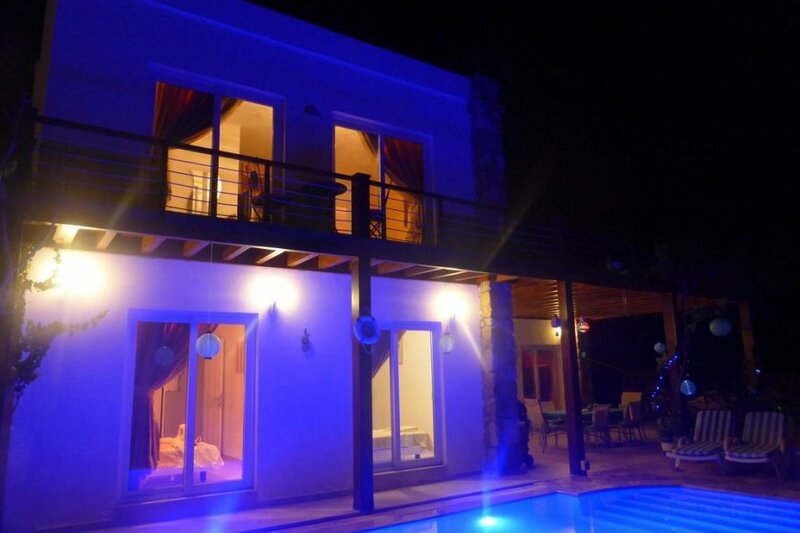 Villa Priene offers a gated entrance, private parking, a private pool, BBQ, extensive sun decking and stunning views of the sea and surrounding area. Beautiful bougainvillea climb the villa walls. The utility/storage room houses the washing machine. Beds 2 and 3 are on the ground floor as is the family bathroom. Both Bedrooms over look the pool and have sea views. The marble staircase from the living room leads to the master suite and galleried area with access to extensive wooden sun deck and mezzanine sun area. On the first floor is the master suite with a large bedroom, leading off to a private bathroom with twin sinks, bath tub & shower. Double Patio doors lead to the upper decks and have wonderful sea views. The villa has fabulous tiled flooring throughout. There is a great stone built BBQ and outdoor bar, equipped with a beer fridge. The tiled pool is Roman shaped tiled with entry steps complete with underwater lighting. Pool size is 30 sq.m. The villa is on an elevated position which ensures that even on the hottest of days they benefit from gentle and cooling breezes. Add this to wonderful sunsets and starry skies and you have a tranquil and picturesque setting, perfect for a relaxing and carefree holiday. There are 6 sunloungers positioned where you can get the sun where-ever it shines. A covered terrace is infront of the living room overlooking the pool, for those looking for a bit of shade. There is a large table and 6 chairs. The bar and BBQ is here. There are 2 upper terraces, one decked, the other tiled. There are giant bean bags on the decks for you to chill out on. There is also a hammock to relax on and enjoy the wonderful views and sunsets. Bakery, Supermarket and The Terrace Bar 5 mins walk. "The supermarket with the best view in the world!"